A mentally ill drug addict. With a criminal history. Of course. How could this possibly be terrorism? Notice, however, buried deep in this report, a most interesting detail: “Second man arrested at the scene was filing [sic] the incident and had a bag containing knives.” He wasn’t filing, he was filming. What kind of mentally ill drug addict decides to drive a car into pedestrians and gets a buddy to fill a bag with knives and come down and film the act? Clearly the filming was for jihad video; we have seen other jihad terrorists, such as Mohamed Merah, who massacred people at a Jewish school in France a few years ago, film their acts so that jihadis can enjoy the bloodshed and recruit others to the cause. If Australian authorities think this wasn’t terrorism, but just more of the global outbreak of mental illness, they’re whistling in the dark. 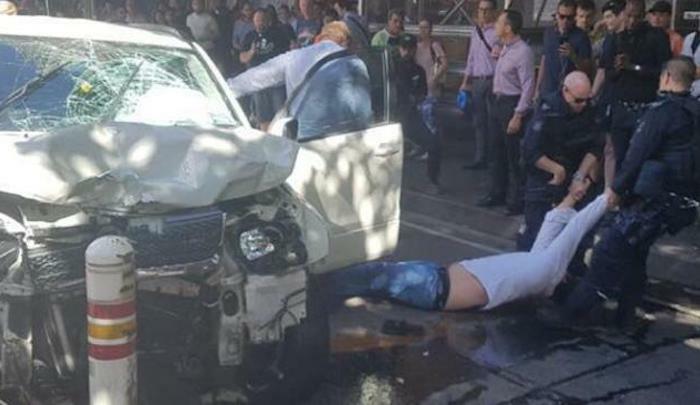 Last June, the Islamic State published a poster depicting an SUV driving over a heap of skulls and bearing the legend “Run Over Them Without Mercy.”“LIVE: Melbourne incident the act of mentally ill drug addict,” by Chip Le Grand,Tessa Akerman, Samantha Hutchinson, Paul Maley, and Paul Johnson, The Australian, December 21, 2017. And the Islamic State issued this call in September 2014: So O muwahhid, do not let this battle pass you by wherever you may be. You must strike the soldiers, patrons, and troops of the tawaghit. Strike their police, security, and intelligence members, as well as their treacherous agents. Destroy their beds. Embitter their lives for them and busy them with themselves. If you can kill a disbelieving American or European — especially the spiteful and filthy French — or an Australian, or a Canadian, or any other disbeliever from the disbelievers waging war, including the citizens of the countries that entered into a coalition against the Islamic State, then rely upon Allah, and kill him in any manner or way however it may be….If you are not able to find an IED or a bullet, then single out the disbelieving American, Frenchman, or any of their allies. Smash his head with a rock, or slaughter him with a knife, or run him over with your car, or throw him down from a high place, or choke him, or poison him….